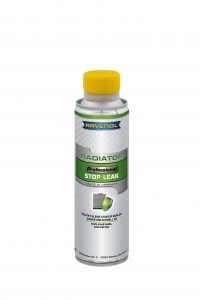 RAVENOL Professional Radiator Stop Leak is a dispersion for protecting the cooling system and the combustion chamber against leaks and increasing operational safety. It permanently seals hairline cracks and leaks, prevents seals from sweating and minimises the loss of coolant from the radiator system. It is also suitable for closed cooling systems. RAVENOL Professional Radiator Stop Leak suffices for up to 10 litres of coolant. Open the heating valve completely. The engine should be at operating temperature. Shake the can and pour the content into the cooling system with the engine running. Add the coolant. After filling, allow the engine to continue to run for at least 10 min, or take a test drive. Check the systems coolant level, absence of air and leak tightness. For lorry radiators mix ratio max. 1:100. Neutral to rubber, synthetic materials, light alloys and non-ferrous metals. Does precisely what it says on the bottle. Quick and easy fix for a small leak in radiator.